Cover of a vintage map of California from Tide Water Oil Company, “You’re always welcome!” at Flying A Dealers; circa 1950. 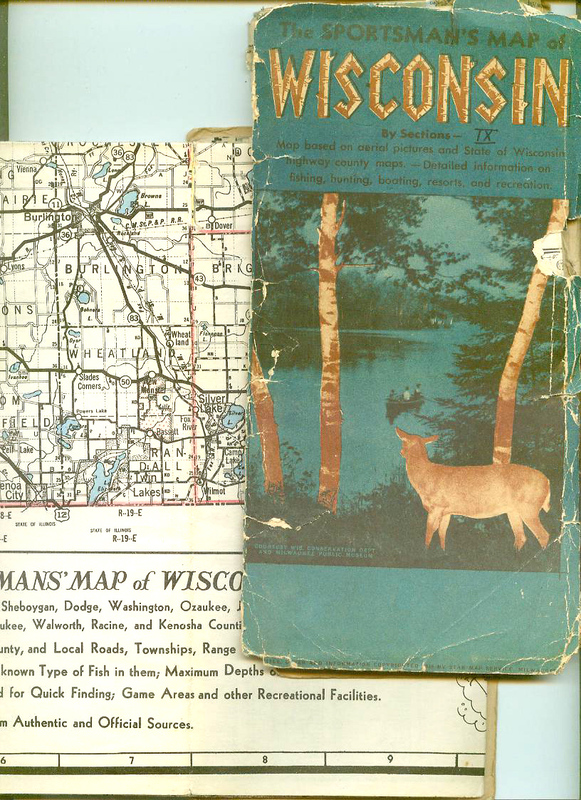 The Sportsman’s Map Of Wisconsin shows you where the deer are. 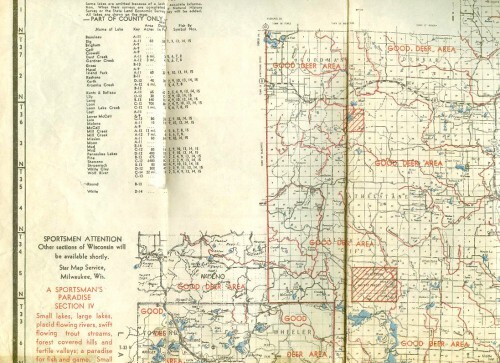 Well, the maps shows you where the deer — Pheasant, Prairie Chickens, rabbits, ducks and fish — were, as these are vintage maps from the 1940s. This auction is for two vintage maps for sportsmen looking to find the best hunting spots in Wisconsin. 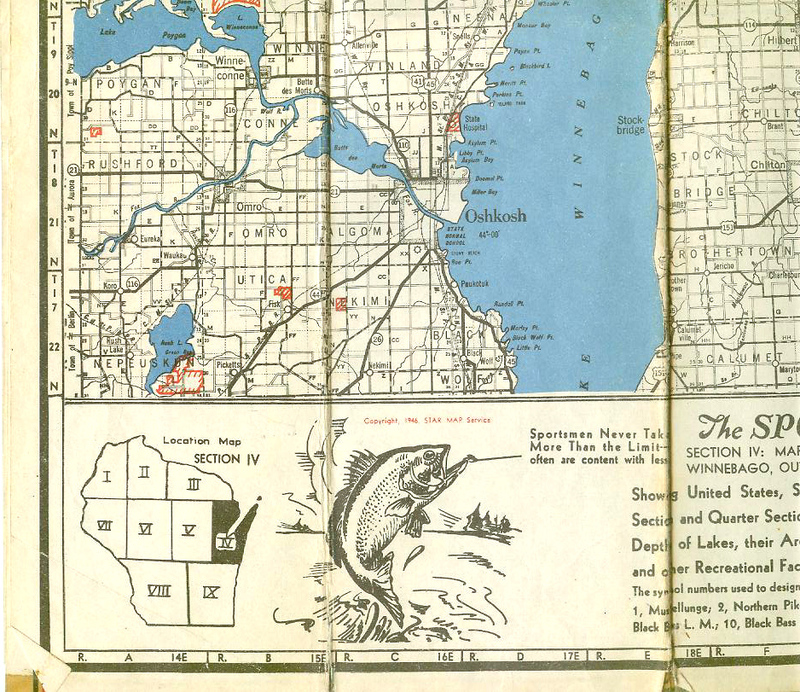 According to the one with the original cover, these maps were “based on aerial pictures and State of Wisconsin highway county maps.” Offering “detailed information on fishing, hunting boating, resorts, and recreation.” Elsewhere on one of the maps, as statement that the Sportsman’s Map was also based on aerial photos and info from the Wis. Forest Service, U.S.G.S. 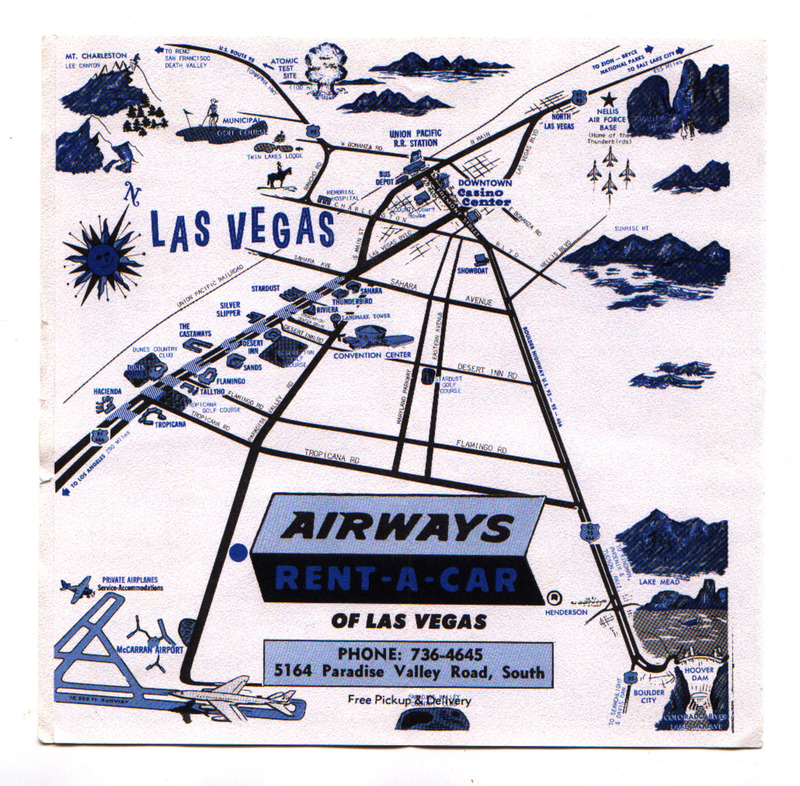 Quadrangles, as well as “authoritative sources” compiled by The Star Map Service. 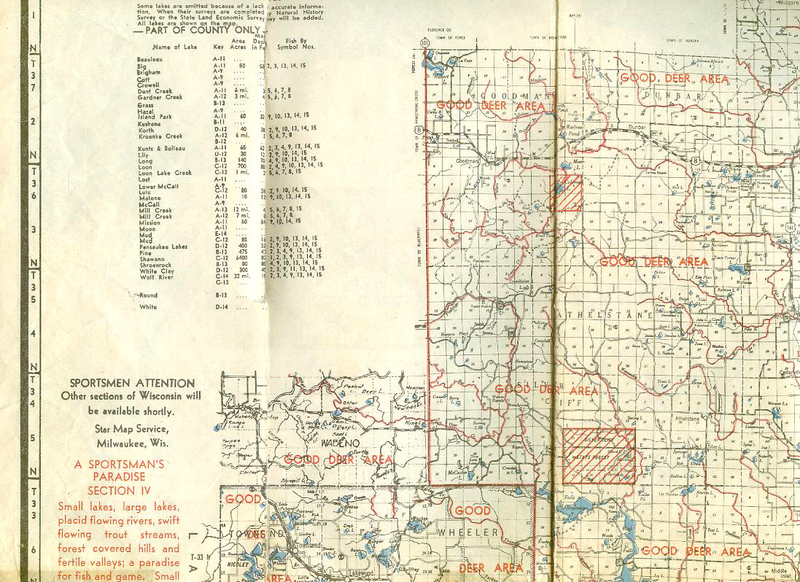 The maps shows you where the deer, pheasant, Prairie Chickens, rabbits, ducks, fish were. Neither map is pristine. One has both front and back cover pieces, but the front piece is no longer attached. It seems in good shape, a few tears. The second has no front cover, the map is torn along folds, yellowing tape is present and even it fails to hold pieces together. What I’m trying to say is that there are enormous signs of wear — but these were used in the field, ya know what I mean? 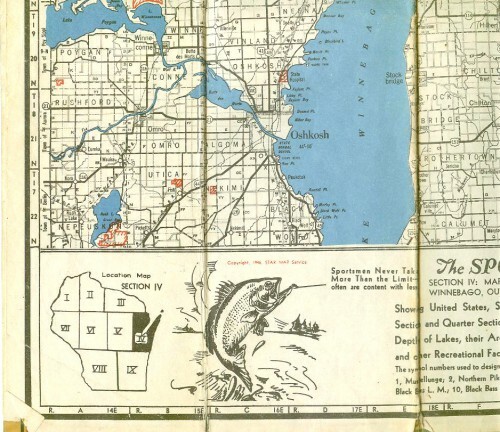 Just be glad there’s nothing icky left on them like fingerprints from grubby bait-holding hands, or guts or anything *wink* — and be glad these vintage maps survived at all. 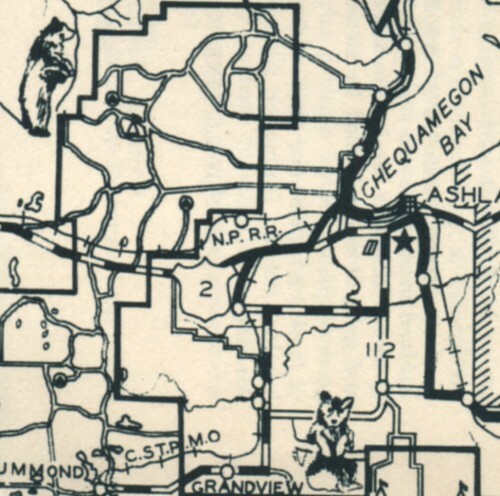 The map in worse shape, is for “Section IV,” Marinette, Oconto, Door, Kewaunee, Brown, Calumet, Manitowoc, Winnebago, Outagamie, and parts of Shawano and Waupaca Counties. This appears to be the first of this series of maps as it bears the following statement: Sportsmen Attention Other sections of Wisconsin will be available shortly. Star Map Service, Milwaukee, Wis. 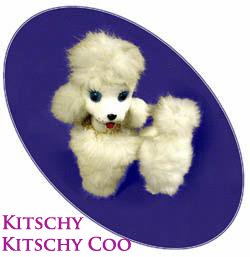 It is dated 1946. 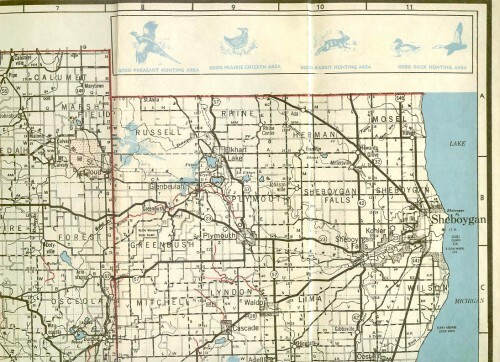 The other map, in nice shape, is for “Section IX,” Fon du Lac, Sheboygan, Dodge, Washington, Ozaukee, Jefferson, Waukesha, Milwaukee, Walworth, Racine, and Kenosha Counties. 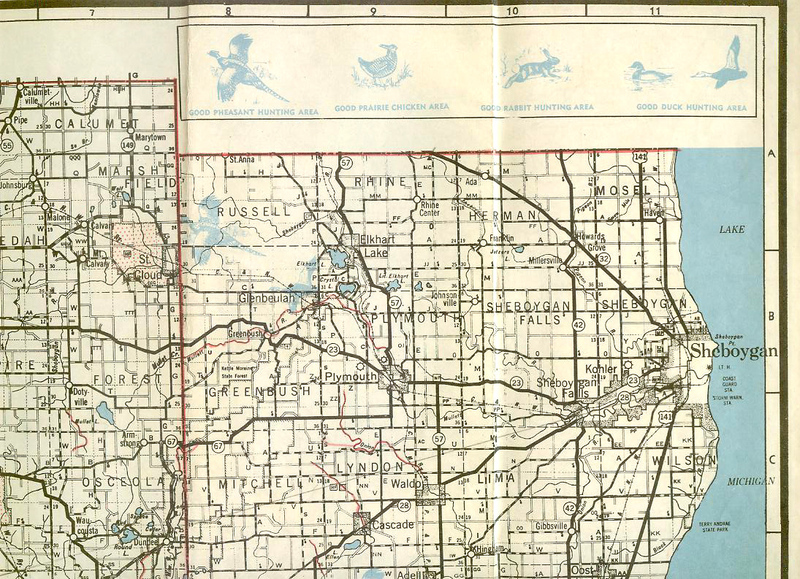 I did not spot any date on this one, but I didn’t want to fiddle too much with them… Best guess as to age lies in the fact that one the side of the map with traditional road map, there is a note that the population figures came from the 1940 Census — this is also on the IV map. Found at Dames Of Chance, where Shawnee fancies traveling back in time. 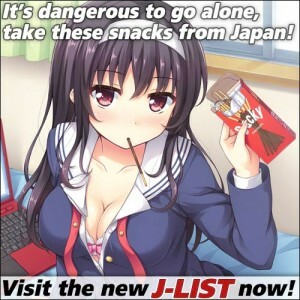 So she needs a vintage map of the area. 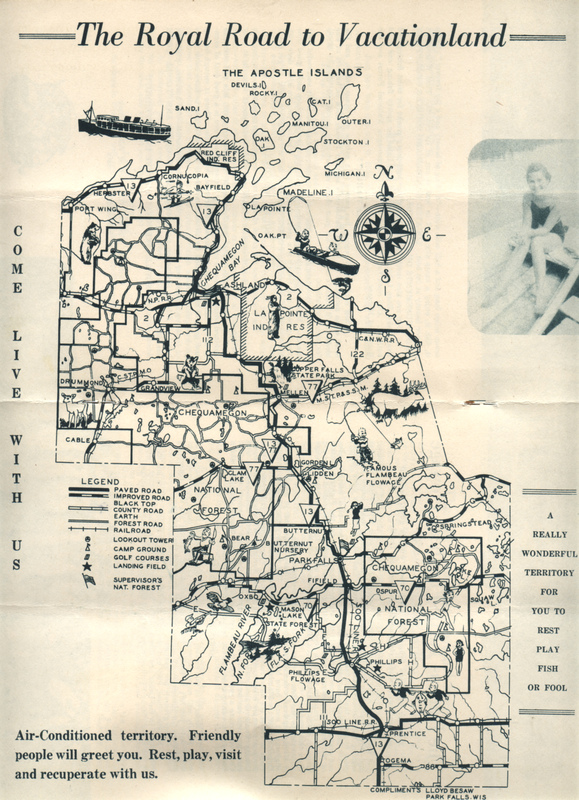 Vintage “Royal Road” map with cute icons from a promotional travel guide of the Chequamegon District of Upper 13, the scenic highway of Northern Wisconsin; circa 1942. This center map has other cute graphic icons for fishing, hunting, golfing, swimming, etc.